Shimla, April 15 (IANS) Twelve people, all belonging to a village in Himachal Pradesh's Chamba district, were killed when a private vehicle skidded off the road and fell into a 700-metre-deep gorge Sunday night, police officials said. All 12 bodies were recovered early Monday from the wreckage of the vehicle, an official told IANS. 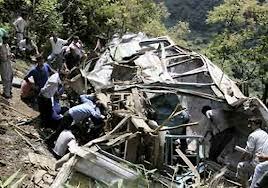 The victims, all from Kuthar village, were returning in a multi-utility vehicle after playing a cricket match. Police officials said the accident occurred Sunday night in Badgran panchayat in Bharmour subdivision, some 85 km from district headquarters Chamba. Eyewitnesses said the authorities had a tough time extricating the victims from the gorge. Chamba is one of remotest places in the state and scarcity and low frequency of passenger buses in the district leads to overcrowding of vehicles.